I admired Hitchens, defiant to his last days, possessed of his own mind, flipping us off even as he departed this world. In fact, anyone who reads the literature of the 1950’s and 60’s will run across a mind control program run by the CIA called “MKULTRA,” the object of which was to find people who could work under control of others without their knowledge. James McGowan trifled with this notion in his book “Programmed to Kill,” in which he speculates that the serial killers of the 60’s and 70’s might well have been subjects of that program. MKULTRA is a fascinating subject. A trip through its history will take the inquiring mind through hypnosis, child abuse, sexual perversion, dissociative disorder, LSD and other drugs, and of course, the torture regime. 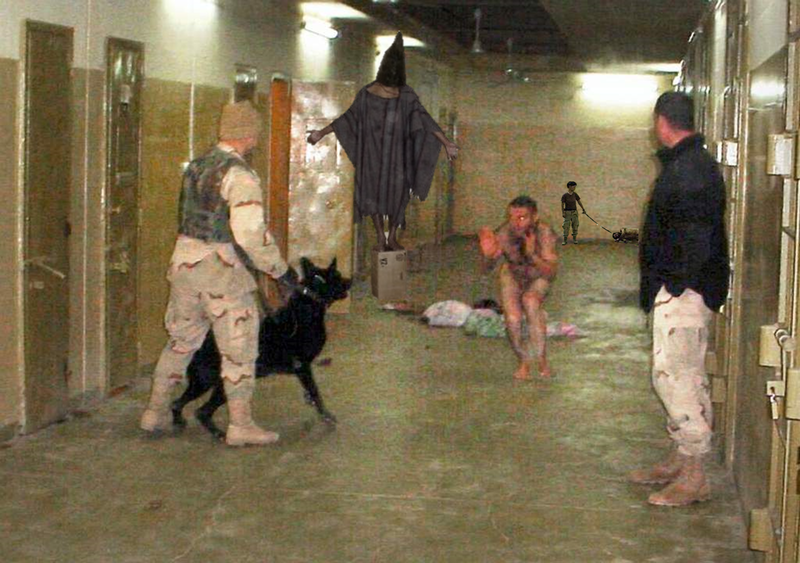 What we saw at Abu Ghraib was not some out-of-control underlings getting off by scaring people with dogs … it was a scientific program of torture designed to induce psychosis. Out of such settings come assassins, suicide bombers, and men who proudly pose for photographs while beheading other men. That’s our CIA. Did the MK program ever stop? MKULTRA was (is?) run by men in business attire sitting behind desks and claiming to be protecting us. But who protects us from them? And though we will never be able to know for sure, people like Sirhan Sirhan, Mark David Chapman, John Hinckley, Jr., Charles Manson, Squeaky Fromme, James Holmes and others all fit the bill, victims of mind control. CIA claims that MKULTRA was a bust, and was discontinued. I doubt it. Look at the photo to the right. 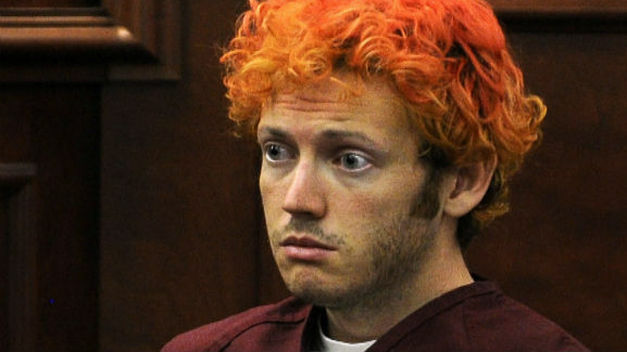 James Holmes is obviously drugged. What kind of drugs? What kind of treatment has he undergone? His mind is gone. * Sirhan Sirhan to this day cannot remember his activities on the night of June 5, 1968 (the only reason he is still alive). A professional hypnotist from Harvard has studied him and finds that he was deeply hypno-programmed. We have a cancer within our body politic, an agency that runs programs like MK, and that determines the fate of our country by means of murder and skullduggery. And we have among us people who are susceptible to mind control. If the bulk of the population were not in such a trance as to not be able to see what is before their every eyes, perhaps we could put a stop to it. I have not linked to anything here. It’s all out there for people of curious bent, and for the others, linking does not prod curiosity. *Will he soon be founding a religious order? Headed to garage but will check out link later today. In the meantime, there is alwasy Jonestown. A massacre of historic proportions, not quite approaching Katyn in scale. As I read it, these people were killed on the spot, those who escaped to the jungles hunted down like animals. The cover story, Kool Aid is ironic, as those who believe the Kool Aid story are the ones drinking the Kool Aid. What do you make of that story? I file it under “extraordinary claims require extraordinary evidence.” I see none, just claims made with great certainty. Pure fiction, perhaps, but a fantastical story with lots of crazy things to investigate on one’s own. Was celebrating sci-fi week here at the country club. Might have gotten a bit carried away — but not by ETs. Not sure of your tilt here. McCain indeed appears at times to suffer from PTSD, perhaps the result of his capture and treatment by the North Vietnamese. Keep in mind that they regarded him as a war criminal, as his plane was shot down while bombing a civilian target. I agree with them but find torture of any human, even war criminals, abhorrent. Richard Hall tried to calculate the odds of two planes, MH17 and MH370, both meeting their ends so suspiciously as they did – happenstance always a possibility of course. But he coupled it with a trial done by the uppity prime minister of Malaysia finding Bush and others guilty of war crimes. Then it seems less unlikely that this particular airlines had been selected for black ops. These cretinous bastards in DC don’t take kindly to underlings speaking up. Yeah but profit and wealth leads to good health. 200 years of good health. He did mention “former colonies breaking free” and trade and peace. I wonder which dots represents the countries the US has attacked. Have you ever been abroad Swede? Non-military traveling? England and the Scandinavian countries. I had a great uncle with homes in Copenhagen and Stockholm. He had dual citizenship, home base and business in NY. Was at one time the leading importer of Swedish steel. Started by selling saw blades out of his car trunk in the thirties. Went here in the 80’s, never been back. I have found that travel abroad opens the mind, changes me. Everyone everywhere is wrapped up in the small local area they occupy, not much thinking about anything big or important. But people everywhere are smart and capable, and live up to their potentials or down to their tendencies, just like us. Americans are not exceptional by any means.